A fleet of 24 JCB skid steers is destined for a unique working life – as the stars of a children’s theme park. The 135s skid steer loaders are being enlisted for duty on the ‘JCB Robots’ driving experience at four Diggerland parks in Kent, Devon, Durham and Yorkshire. They will join a host of JCB machines at the construction themed fun parks, which feature attractions such as driving the iconic JCB 3CX backhoe loader, riding in the ‘Groundshuttle’ – a JCB 540-140 with 15 seats, and being elevated to 18m in the air in a JCB 540-180. The Theme Park also has JCB 135 skid steer and 3CX backhoe loader racing experiences for adults, amongst other events. 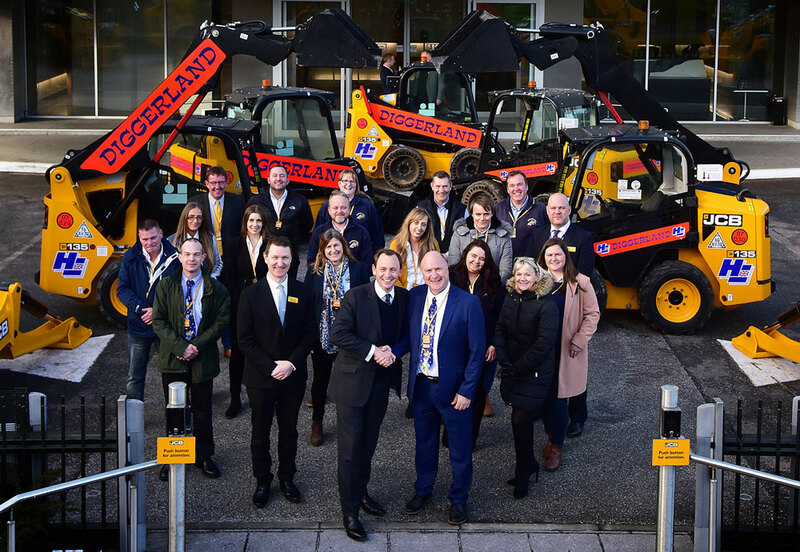 The deal, worth £650,000, was placed through dealer Greenshields JCB and cements a long-standing relationship with Diggerland which was launched in 2000 by H.E. SERVICES boss Hugh Edeleanu. Hugh started in business back in 1972 with a single JCB backhoe loader, going on to build the UK’s largest specialist excavator hire company with a fleet of over 3,500 machines.